Research notes taken on subjects around multimedia, electronic texts, and computer games. Shakespeare’s ability to distil human nature into an elegant turn of phrase is rightly exalted – much remains vivid four centuries after his death. 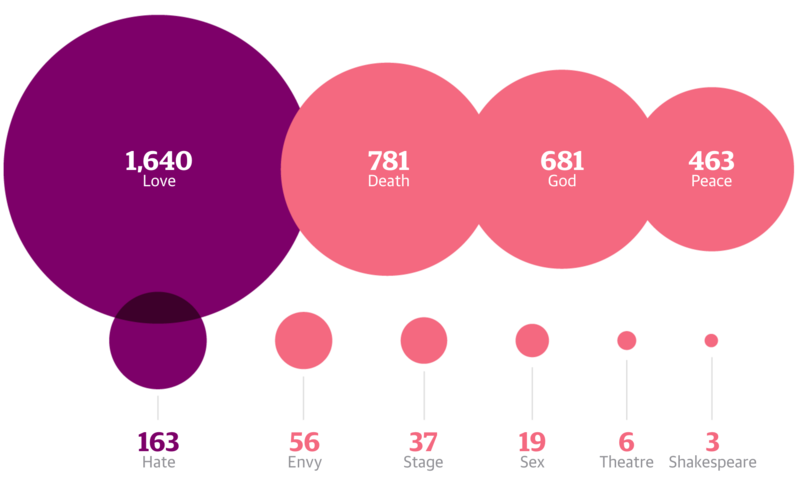 Less scrutiny has been given to statistics about the playwright and his works, which tell a story in their own right. Here we analyse the numbers behind the Bard. The authors offer a series of visualizations of statistics about Shakespeare that are rather more of a tease than anything really interesting. They also ignore the long history of using quantitative methods to study Shakespeare going back to Mendenhall’s study of authorship using word lengths. Mendenhall, T. C. (1901). “A Mechanical Solution of a Literary Problem.” The Popular Science Monthly. LX(7): 97-105.